Education with a Higher Purpose! A quality education with biblical Christianity at its foundation! Building character, citizenship, and spiritual convictions as well as knowledge in order to equip every child to succeed in life, not just in business! 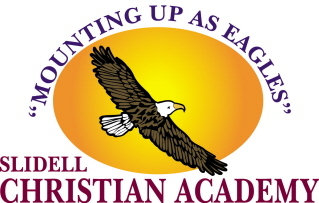 Founded in 1986, Slidell Christian Academy is an American Association of Christian Schools (AACS) Member School. Slidell Christian Academy was created and exists today as an extension of the body of Christ. It is our goal to provide a safe, challenging environment where each child will experience the joy of learning and succeeding in academics as well as becoming all that God created them to be! We utilize the complete Abeka Curriculum in a non-denominational setting particularly suited to today's families seeking biblical solutions to life's situations! For more information, go to Slidell Christian Academy's website at SlidellChristianAcademy.com or email info@SlidellChristianAcademy.com .